When it comes to picking a Walt Disney World Resort hotel, it can be hard to know where to start! Disney’s Grand Floridian Resort & Spa is a Disney Deluxe Resort one monorail stop from the Magic Kingdom. With over 25 resort hotels to choose from in Walt Disney World, it can be hard to know where to begin when it comes to choosing where to stay! Before delving into which specific resort to stay in, it’s generally best to decide which category of resort is going to be best for you and your family. Walt Disney World has resorts for every style and budget, so you’ll undoubtedly find one that’s perfect for you! In a nutshell, Walt Disney World has three resort categories: Value, Moderate and Deluxe. There are also Disney Deluxe Villa Resorts, but I’ll go over those in another blog post. The Value Resorts include Disney’s Pop Century Resort, Disney’s All-Star Movies, Disney’s All-Star Music, Disney’s All-Star Sports, and Disney’s Art of Animation Resort. Disney’s Art of Animation Resort is a bit different because it offers mostly Family Suites, which are quite a bit larger than the standard rooms. However, there are a handful of standard rooms at Art of Animation, themed after the Little Mermaid. 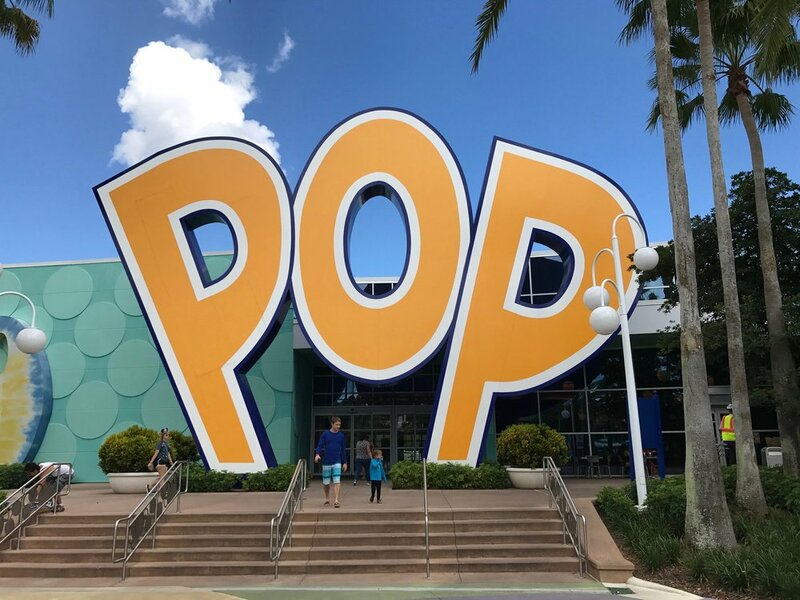 I generally suggest going with Disney’s Pop Century Resort in this category because it has been updated most recently, and the new rooms are very nice! If you’re not planning on spending much time at your resort or in your room, or if you’re on a budget, Disney’s Value Resorts are a great option, especially if this is your first trip to Walt Disney World. In the Moderate Category, you’ll find some nice middle of the road options. These include Disney’s Port Orleans - Riverside, Disney’s Port Orleans - French Quarter, Disney’s Caribbean Beach, Disney’s Coronado Springs Resort, and the Cabins at Disney’s Fort Wilderness. The Cabins at Disney’s Fort Wilderness are also large family suites, but the other resorts will be more like standard hotel rooms. Disney’s Coronado Springs and Disney’s Caribbean Beach are both currently under construction, so I wouldn’t necessarily recommend them right now, however, you can also get some great rates at these properties during this construction phase. Disney’s Port Orleans - Riverside is my favorite of the Moderate Resorts. Disney's Moderate Resorts offer a blend of great theming and value. I usually suggest something in the Moderate Category if you’re planning on spending a decent amount of time at your resort during your stay, or if your family needs a bit more space. Disney’s Port Orleans - Riverside is a Moderate Resort and is the People Mover Travel choice for best resort in that category. Finally, there are the Disney Deluxe Resorts. In the Deluxe category, you’ll find Disney’s Animal Kingdom Lodge, Disney’s Beach Club Resort, Disney’s BoardWalk Inn, Disney’s Contemporary Resort, Disney’s Grand Floridian Resort & Spa, Disney’s Polynesian Village Resort, Disney’s Wilderness Lodge, and Disney’s Yacht Club Resort. Deluxe Resorts are top notch with high end amenities and wonderful theming! They are the top of the line hotels in Walt Disney World, and they are all world class resorts. They have many different options as far as room types go - everything from standard rooms to 2-Bedroom Villas. My favorite Deluxe Resorts include Disney’s Grand Floridian Resort and Spa, Disney’s Polynesian Village Resort, Disney’s Animal Kingdom Lodge, and Disney’s Wilderness Lodge. As far as resorts go, the good news is that there is no wrong answer! All the Disney resorts are absolutely amazing. When it comes to looking at Moderates vs. Deluxe Resorts, there are a few things to consider. Deluxe Resorts do offer a few nice amenities that make it worth while for a lot of people. First of all, and probably the biggest factor, would be the proximity to the parks and transportation. Many of the Deluxe Resorts are right along the Monorail, which gives you direct access to Magic Kingdom and Epcot. Others are within walking distance to Epcot, while still others have direct access to parks via water taxis (all resorts have access to the parks via busses). This means less time on busses and generally less time using transportation. For instance, if you stay at Disney’s Grand Floridian Resort & Spa, you can decide to hop over to the Magic Kingdom and be there within 10 minutes! Also, Deluxe rooms have indoor facing entry doors (enter your room from an indoor hallway vs from an outdoor passage), and all deluxe rooms have balconies. When it comes to looking at Moderates vs. Value Resorts there are also a few things to consider. First of all, you have to take into consideration room size. The rooms at the Value Resorts run around 260 square feet & the Moderate Resort rooms run around 330 square feet (Deluxe Resorts are generally 500+). On top of that, in the Moderate Resorts you get Queen Size Beds (as opposed to Double Size in a Value), and often times, you’ll have other small room amenities such as a ceiling fan and coffee maker. You’ll also have two bathroom sinks instead of just one. The other advantage you get at a Moderate Resort is in the transportation around Walt Disney World. At a Moderate Resort, the bus stops will be covered and often have seating while you’re waiting for your bus. You’ll also have a time screen showing when your bus is slated to arrive. At some of the Value Resorts, the bus stop is out in the open, there is no time schedule, and very little seating. The Moderate Resorts often also come with an additional means of transportation. So for instance, at Port Orleans - Riverside & Port Orleans - French Quarter, there is a boat that takes guests directly to Disney Springs! Disney’s Pop Century is a Value Resort, and People Mover Travel’s pick for best option in that category! Another note on transportation - Disney’s All-Star Resorts will often times share a bus for all three resorts (not always, but enough that I’ve seen it on multiple occasions), while Pop Century and Art of Animation generally have their own busses. Disney’s Moderate Resorts, however, will also sometimes do this, with Disney’s Port Orleans - Riverside and Disney’s Port Orleans - French Quarter also sharing busses on occasion. Disney’s Caribbean Beach also has an internal bus system, which means even though it does not share busses with other resorts, it can sometimes take a long time to get where you’re going. So, that all being said, when it comes to transportation, it’s more on a resort by resort basis, and not necessarily a matter of looking at Value vs. Moderate Resorts. As far as theming goes, the Value Resorts tend to be more “over-the-top” in their Disney theming. Depending on the theming of the hotel, you’ll find oversized statues of Disney characters, sports equipment, musical instruments or fun nostalgic paraphernalia. That eccentric theming makes the Value Resorts a top choice for many families with young children! In the Moderate and Deluxe Resorts, you’ll find more subtle theming. The theming at these resorts will still be top of the line and totally immersive, but it will be more nuanced and complete. For instance, at Disney’s Wilderness Lodge, you’ll feel as though you’ve actually been transported to the Pacific Northwest. There will be very subtle nods to Disney in these resorts, but they won’t have that exaggerated theming. Disney’s Value Resorts will have “over-the-top” theming, while Moderate and Deluxe Resorts will have more nuanced theming. All resorts now offer mini fridges in the rooms as well as complimentary wifi. Also, when staying in any Disney owned resort, you’re able to book your FastPass+ reservations 60 days in advance (vs. 30 days in advance for those staying off property). Now, that all being said, all of the resorts are pretty amazing! Having stayed in nearly all of them, they really are all great options. You can go with a Disney Value Resort that can save you some money without sacrificing the Disney service, or you can go all out and do really extravagant in the Disney Deluxe Resort! They are all well themed, clean, and beautiful hotels. When you go to Walt Disney World, where do you like to stay? Contact People Mover Travel to discuss your specific travel needs! Are you wanting to head out on a Walt Disney World vacation, but you don’t know where to start? Contact me to find out how I can personally assist you in planning your own magical adventure! Follow the link below to fill out a no-obligation quote form for People Mover Travel! When you book through me, you get an expert Disney planner that can book your resort, park tickets, transportation, and even all your dining & FastPass+ reservations. The best part, I work for you for free! Newer PostMagical Days in the World | Give Yourself a Break! Older PostDisney's FastPass+ | Everything You Need to Know!